Because I have my hands in so many buckets, a few of you have asked how I manage it all. The truth is, I’m trying to cut back, working to choose priorities and stick with them. I also make conscious lifestyle choices, like living mostly TV-free; that goes a long way. But like all of you, I only have 24 hours each day. Sixteen when you cut out sleep time. Seven when you cut out work and commute. So I think a lot about how to make the most of those seven hours. Rapportive. If you try none of the others, try this. Rapportive is a Gmail plug-in that shows you where the people who email you live on the web. Say you get an email from Jack, who reads your blog. On the right-hand side of your screen, Jack’s picture and profile links will pop up. You can not only see his tweets, you can click on his Twitter profile and follow him. If he’s on LinkedIn, Facebook and Flickr, those profiles will pop up, too. This makes it oh-so-easy to connect beyond Gmail with anyone who sends you a note, which helps you grow your network exponentially. 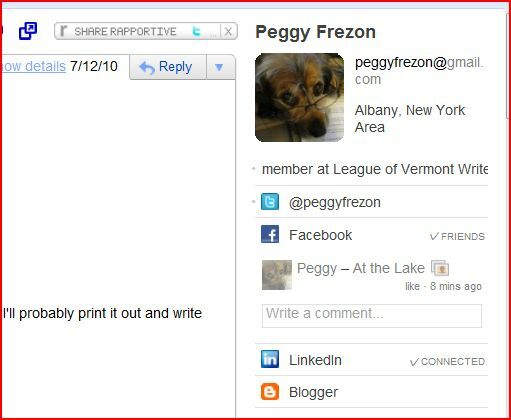 Rapportive makes it easy to connect with Peggy. Teux-Deux. Lists help me stay organized; I’m always crossing items off my to-do list. And with Teux-Deux, my list is digital. This is the simplest tool you’ll ever sign up for. It spells out each day of the week, and you can add your to-do items under the appropriate day. When you’ve done something, you cross it off by clicking with your mouse. You can move items from one day to another, too, which means when I don’t finish everything on Monday, I simply move it to Tuesday. The best part is that I can never lose this list! It’s web-based, so I can sign in from work, home, a friend’s house, you name it. My list is always waiting for me. Evernote. While I use Teux-Deux to keep track of lists, I use Evernote to keep track of everything else. It’s a notes-based system, and I have a note for everything: my passwords, book-promotion ideas, interviews, even random stuff I don’t want to forget. This tool is also web-based, which means I can access my passwords or anything else both at home and at work. There’s also a phone app for Evernote, but the Android version was adding crazy spacing to my notes, so I abandoned that and only use it on my computer. You can store far more than text with this tool. When I went away for a few days, I took a photo of my whiteboard, which spelled out the book edits I needed to make, and stored it in my Evernote file so I could pull it up anywhere. There are lots of other uses for Evernote too; I’m a pretty elementary user. Hootsuite. My social media presence so relies on Hootsuite that I felt out of sorts recently when it failed to work for an entire day (that’s unusual). Hootsuite lets you schedule tweets; see all of your @replies, direct messages, and more without toggling from screen to screen; and easily sort through lists of tweeps to pick out the most relevant information in your Twitter stream. Lots of folks use TweetDeck instead, but I prefer Hootsuite because it’s web-based, which means you don’t have to download anything special to use it, and you can access it anywhere you have an Internet signal. You can also schedule Facebook and LinkedIn updates via Hootsuite, but it’s really a game-changer when it comes to Twitter, mostly in terms of time management. If you’ve been using Twitter for six months or more and don’t yet use Hootsuite or TweetDeck, get on that. I’m telling you, it will change your Twitter life. Social media thug Marian Schembari has a great tutorial on how to use Hootsuite. Google Reader. If you’re wondering how I follow 150-200 blogs, Google Reader is the answer. This RSS reader pulls updates from all the blogs I like into one place, which saves me a ton of time. Every morning, rather than trying to remember and visit all the blogs I’m interested in, I flip quickly through my Google Reader, which alerts me whenever those blogs have a new post. I use the “J” key to move foward and the “K” key to move back, which lets me get through 100 updates or so each morning in about 15 minutes. When there’s a post I like, I use Hootsuite to schedule a tweet about it later in the day — that way all my tweets don’t go out at once. Mashable recently ran a post on how to get the most out of Google Reader. I organize my Reader into topic folders. And I’ve helped some clients organize into a tier system, so if they’re too busy to flip through all the blogs they follow, they can go through the most important ones in Tier 1 and save Tier 2 or even 3 for later. Time management, baby! Mint. I’m saving money for my next career break, and if you’re reading this blog, you’re likely saving up for your leap, too. Mint helps me budget by showing how much I spend each month on rent, clothes, restaurants, etc., which means it’s easy to see where I’m over-spending. It grabs information from various accounts, lets me set goals, alerts me when I’ve gone over my budgets and more. It’s easier to take leaps in life when you have a financial safety net, so I’m using Mint to help weave mine. What digital tools help you take control of your life? Wow Lexi — impressive list!! Your tip for tiers in google reader has been invaluable to me. Thanks! Wow, thanks for the tip on Google Reader. I have lots of blogs that I follow, but can’t get to all of them like I’d like too. I just organized my reader with your tip and used Tiers! Oh Lexi, you are so sophisticated. I want to use all the tools you share above, but am a bit intimidated about the start up. I have bookmarked them for another day soon! Thanks! Most of these (aside from Hootsuite) are really simple! You’d understand and appreciate them quickly. Thanks for the great tips! I did try Mint, but like so many other folks, I am disappointed that I can’t delete transactions. All great tips! These in fact do keep a person sane. It’s amazing what you can do with digital tools these days.